Mithridates II (Parthian: 𐭌𐭄𐭓𐭃𐭕 Mihrdāt) was king of Parthian Empire from 124 to 88 BC. He was already known as "the Great" in antiquity. He is the first Parthian ruler to regularly use the title of "King of Kings", thus stressing the Parthian association with the Achaemenid Empire. Considered one of the most prominent monarchs of the ancient East, his reign marked the rise of the Parthians as a superpower. He spent most of reign consolidating his rule in the Near East, successfully re-conquering Babylonia, and turning the kingdoms of Armenia, Adiabene, Characene, Gordyene, and Osrhoene into vassal states. He also captured Dura-Europos in Syria, and restored Parthian authority in Sakastan, which was given as a fief to the House of Suren. During the last years of his reign, however, his empire fell into disarray, with the Parthian nobility having enough authority to challenge the Parthian king periodically, including a rival-monarch named Gotarzes I (r. 90 – 80 BC), who claimed the throne. Following Mithridates II's death in 88 BC, Gotarzes ruled Babylonia, while Orodes I (r. 90 – 80 BC) ruled the eastern territories of the empire separately. Mithridates is the Greek form of the Iranian theophoric name of Mihrdāt, meaning "gift of Mithra". The Old Persian version is Miθradāta (𐎷𐎡𐎰𐎼𐎭𐎠𐎫), whilst the Modern Persian version is Mehrdād. At the time of his succession, the Parthian Empire was reeling from military pressures in the West and East. Several embarrassing defeats at the hands of eastern nomads had sapped the strength and prestige of the kingdom. However, Mithridates II proved himself to be a capable king and was soon able to reincorporate Babylonia into the kingdom, which had been lost to Characene a short time before. As a sign of victory he had the coinage of the Characene ruler Hyspaosines overstruck, although he had already died in 124 BC. The whole of Mesopotamia was taken in a rush and he reached Dura-Europus in 113 BC. Mithridates II then attacked Armenia, then ruled by Artavasdes I and took hostage the Armenian king's son, the future Tigranes the Great. This was the first time that the Parthians actively interfered in Armenian politics. In the east of the Empire, the situation seemed unsalvagable. Invading nomads (called Scythians in the Greek sources and Sakas in Indian sources) had destroyed the Greco-Bactrian Kingdom and greatly threatened the eastern borders of the empire. However, Mithridates II was able to fend off the attacking nomads and reincorporate the provinces of Parthia and Aria back into the realm. He was able to reconquer the region of Sakastan, which had since c. 129 BC been under the control of nomadic peoples, mainly the Eastern Iranian Saka (Indo-Scythians) and the Indo-European Yuezhi. He gave the province as a fiefdom to the House of Suren, and also further expanded his rule as far as present-day southern Afghanistan. In 121 BC the Chinese under Emperor Wu of Han had defeated the Xiongnu in the east and were expanding westwards in force. In Ferghana the Chinese sphere of influence encountered that of the Parthians. A Chinese delegation to the Parthian court is attested for the year 120 BC. 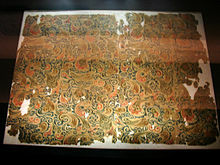 In the following year the Silk Road was opened. The Armenian King Tigranes I died in 95 BC and Mithridates II put the Armenian heir Tigranes II, who had hitherto lived among the Parthians, on the Armenian throne. Soon after this Mithridates II attacked Adiabene, Gordyene and Osrhoene and conquered these city states, bringing the western border of the Parthian realm to the Euphrates. Here the Parthians encountered the Romans for the first time. In 96 BC Mithridates II sent a certain Orobazos as an envoy to Sulla. While the Romans were increasing immensely in power, the Parthians sought friendly relations with the Romans and thus wanted to reach a agreement that assured mutual respect between the two powers. Negotiation followed in which Sulla apparently gained the upper hand and Orobazos made himself and the Parthians look like suppliants. The actual result of the negotiations is not known, but it can be assumed that the border was set at the upper Euphrates. Orobazos would later be executed. The Parthian diplomatic affairs with the Romans and Chinese demonstrates their rise as a superpower. By the late 90s BC, Mithridates II seems to have faced internal political issues. In 93/2 BC Mithridates II's nephew, Sinatruces, rebelled in Susiana. He proclaimed himself king and held the region until 88/7 BC, at which point Mithridates II's son, Gotarzes I, forced him to flee to the Central Asian steppe. Sinatruces later returned to the Parthian throne in 77/76 BC with the aid of Sakae mercenaries. Mithridates II did not outlive the usurper and died in 91 BC. There are clear signs that the Parthian empire was restructured under Mithridates II. The last administrative texts in cuneiform were written under his rule. Temples in the Babylonian style were replaced by some in a more Hellenic/Parthian style. Both facts seem to indicate that the temple administration system which dated back at least to Nebuchadnezzar II did not continue. The oldest documents yet discovered from Nisa belong to his reign. The portrait of the king is almost exclusively known from his coinage. It is possible to identify several types of depiction in the coinage. He can be shown with a short beard and a diadem, but there are images which show him with a mid-length beard or with a long beard, still wearing the diadem. A completely different type of image shows him with a high domed tiara on his head. At Mount Behistun, now in the west of Iran, there is a rock relief which shows the king and four vassals or officials, who make obeisence to him. There are accompanying inscriptions in Greek. The relief is now in a bad state and known only from old copies. Since the early 2nd-century BC, the Arsacids had begun adding obvious signals in their dynastic ideology, which emphasized their association with the heritage of the ancient Achaemenid Empire. Examples of these signs included a fictitious claim that the first Arsacid king, Arsaces I (r. 247 – 217 BC) was a descendant of the Achaemenid king of kings, Artaxerxes II (r. 404 – 358 BC). Achaemenid titles were also assumed by the Arsacids, including the title of "king of kings" by Mithridates I (r. 171 – 132 BC). However, the title was infrequently by the latter, and it was first under Mithridates II, from c. 109/8 BC onwards, that the use of the title became regular. The early Arsacids had originally worn a soft cap, known as the bashlyk, which had also been worn by Achaemenid satraps. From Mithridates I, the Hellenistic diadem was used by the Arsacid kings. The diadem was also used during the early reign of Mithridates II, till he later started using a distinctive crown that was of Median heritage. The crown would be continued to used by his successor, and later also the vassal kings of the Arsacids, such as the Kings of Persis. ^ a b c Frye 1984, p. 213. ^ a b c d e f g Schippmann 1986, pp. 525–536. ^ a b Kia 2016, p. 53. ^ a b Bivar 2002, pp. 135-136. ^ Bivar 1983, pp. 41–44. ^ Frye 1984, pp. 212-213. ^ Frye 1984, p. 214. ^ Frye 1984, p. 193. ^ Bosworth 1997, pp. 681-685. ^ Garthwaite 2005, p. 78. ^ a b Dignas & Winter 2007, p. 12. ^ a b c d e Daryaee 2012, p. 179. ^ Frye 1984, p. 217. ^ Sellwood 1983, p. 304. Schippmann, K. (1986). "Arsacids ii. The Arsacid dynasty". Encyclopaedia Iranica, Vol. II, Fasc. 5. pp. 525–536. Daryaee, Touraj (2012). The Oxford Handbook of Iranian History. Oxford University Press. pp. 1–432. ISBN 0-19-987575-8. Vologases IV of Parthia was the ruler of the Parthian Empire from 147 to 191. He was the son of Mithridates IV of Parthia (129–140).